Reports indicating that Italy is close to establishing a bad bank prompted one wag to ask if Italy does not already have enough. The country may be better served by setting up a good bank. The sharp sell-of in shares of Italian banks this year is an important driver of G7-leading 12.4% slide in the local bourse this year. 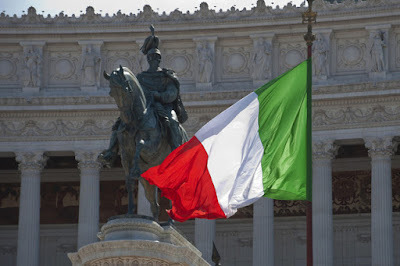 The Renzi government has been trying to establish a "bad bank" to warehouse the non-performing loans (NPLs) that are hardening the arteries of Italy's financial system, and contributing to the economy's sclerosis. However, he has found it difficult to secure the EC's approval. First, the EC wants to minimize state support for banks, and especially in Italy, which has the highest debt in EMU after Greece. Second new rules went into effect at the start of the year (Bank Recovery and Resolution Directive), ostensibly protects taxpayers by bailing in more stakeholders, including senior creditors. Also, the new rules require that 8% of the bank's liabilities need to be wiped out before public money is used. Few observers seem to grasp the implication of the Bank Recovery and Resolution Directive (BRRD). Many were surprised when Portugal forced a haircut on some senior creditors at the end of last year, but the new directive makes bonds less appealing by making them less safe. The BRRD is particularly important for Italian banks because they are more reliant on debt securities than other banks in EMU. The share of debt securities, including certificates of deposit, accounts for 16% of Italian bank liabilities compared with about 7% for the EMU as a whole. The bond-to-deposit ratio is near 40%, the second highest behind Germany. The EU pushed back against Renzi's initial bad bank plans because it appeared to include a subtle form of state assistance. He has responded with a new version that offers a lighter touch. Rather than bundle up the NPLs in a common pool, the new version, would allow investors who buy NPLs could also to buy a guarantee for some protection. More details of the guarantees are expected in the coming days. Part of the challenge in Europe has been that there was no agreed upon definition of NPL. However this changed at the start of last year, and there is now a harmonized definition at the European level. As of the middle of last year, NPLs at Italian banks was estimated by the central bank to be about 18% of outstanding loans or 200 bln euros. All too often the conversation ends with the recitation of the size of Italy's NPL problem. This offers an incomplete picture because Italian banks have been making provisions to cover the bad loans. By the middle of last year, Italian banks made provisions that covered about 45% of the NPLs. In fact, the provisioning wiped out the entire sector's operating profits in 2013. If many observers do not appreciate the high coverage of the NPLs, they also do not appear aware of the limited state aid that Italy has provided for its banks. The most recent data we found was for through the end of 2014. State aid to Germany banks amounted to 238 bln euros or 8.2% of GDP. State aid to Spanish banks was 52 bln euros, equivalent to 5% of GDP. The Dutch government gave its banks 36 bln euros or 5.5% of GDP. Portugal and Belgium each gave their national bank 9 bln euros (which accounted for 11% and 4.6% of GDP respectively). The comparative figure for Italy will surprise many. As of the end of 2014, Italy had given its banks one bln euros, which had been repaid with a small gain for Italy's Treasury. The rest of EMU is nursing a loss of almost 2% of GDP. Despite the provisioning, the high levels of NPLs have discouraged new lending by Italian banks. However, the situation was improving toward the end of last year. The ECB acknowledges this and recognizes that the restrictive credit standards eased the most in EMU in Q4. While Italy may have been guilty of foot-dragging in the past, Renzi has shown greater urgency more than a year. Brussels appear to be the hold-up, and some part of that is a function of a new set of rules (BRRD). Also, the institutional capacity that EMU has built is still finding it way. The Single Supervisory Mechanism's request for more information on the NPLs of some lenders could have been better communicated so as not to appear to single out four Italian banks. To be sure this is not a recommendation to buy or sell any security. It is meant to shed light on Italian banks and NPLs that are widely being discussed in the press as the long awaited Italian bad bank seems close to being launched. Establishing a bad bank will help create good banks, or, at least, better banks, and may encourage consolidation, as well as new lending. Tangentially, we caution that the implications of the BRRD may not yet be fully understood by creditors.